The following excerpts are from Kurt Schwitters by John Elderfield (Thames and Hudson, 1985). In the winter of 1918, Germany plunged into revolution; the Great War was ended and the Weimar Republic proclaimed. When the revolution reached the solidly bourgeois city of Hanover, Kurt Hermann Eduard Karl Julius Schwitters was working as a mechanical draftsman in the WŸlfel ironworks outside the city, while painting and writing poetry in his spare time. He was thirty-one, and beginning to make a small reputation for himself: that June, some of his paintings had been exhibited at the renowned Sturm gallery in Berlin. . . .
"I called my new manner of working from the principle of using any material MERZ. That is the second syllable of Kommerz [commerce]. 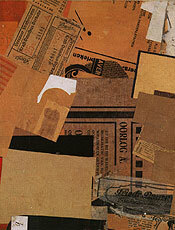 It originated from the Merzbild [Merzpicture], a picture in which the word MERZ, cut-out and glued-on from an advertisement for the KOMMERZ- UND PRIVATBANK [Commercial and Private Bank], could be read in between abstract forms. The word MERZ had become a part of the picture by being attuned with the other parts, so it had to stay there. You will understand that I called a picture with the word MERZ the MERZbild in the same way that I called a picture with "und" [and] the und-bild and a picture with the word "Arbeiter" [worker] the Arbeiterbild. When I first exhibited these pasted and nailed pictures at the Sturm [gallery] in Berlin, I searched for a generic term for this new kind of picture, because I could not define them with older concepts like Expressionism, Cubism, Futurism or whatever. So I named all my pictures as a species MERZbilder after the most characteristic one. Later I expanded the title Merz, first to include my poetry, which I had written since 1917, and finally to all my relevant activities. Now I call myself MERZ." . . .
For Schwitters, Merz meant assemblage, that is to say, a principle or method of working rather than a specific genre or medium of art. Although Merz derived originally from a painting context, once it had been formally established in July 1919 it was quickly expanded in a whole variety of directions, some remote from painting but all in their different ways using distinct and individual material units -- be they objects, words or graphic forms -- in an additive and constructed way. 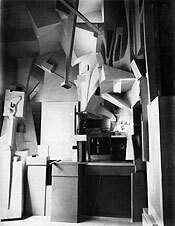 In swift succession there appeared Merz sculptures, Merz drawings, Merz poems and prose, Merz performances and Merz theater, and on a grander scale, the environmental Merzbau which gradually obliterated the interior of Schwitters' house. All this, however, Schwitters insisted, was not merely a program of diversification. When he announced his expansion of Merz in October 1919, he explained that his ambition was to create a Gesamtkunstwerk, or total work of art. 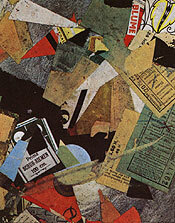 Even the early Merzbilder, he once suggested, were but preparatory studies for such a conception: the lower echelons of a hierarchy of expression that reached gradually beyond the individual arts, effacing their boundaries, and which would eventually transform the whole of life -- or at least Schwitters' life -- into a kind of total Merz activity. . . .
His was not a simply quiescent or merely nostalgic art. The creation of order, as much as the order itself, was the subject of what he did: the sense of competition between the artist and his surroundings that is given along with the order adds drama and excitement even to his smallest creations. And that, as much as the order itself, carries with it the power to touch us -- if only because it tells of a struggle we all must know. 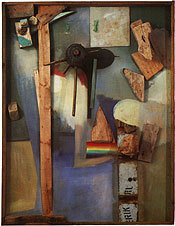 For Schwitters, it was a kind of struggle that admitted no final or single victory, but had to be fought out daily as new surroundings, new styles, new influences kept on altering the context in which he worked. Neither this nor the order to which he was committed was ever changed. The point of order he wrested from the tumult of his early revolutionary years became the ideal to which he was henceforth committed. The fight for that order continued throughout his life. "Kurt Schwitters was born a rebel," writes one of his friends. "He died a lyrical poet." The lyrical, in fact, was there from the start, and the rebellion to the very end.